Holy Family Girls’ Hockey Is Fire on Ice! At a recent Friday morning Convo, a daily event where Holy Family students gather as “family” in the school gym, everything was going as planned. First daily prayers, followed by the Pledge of Allegiance. And then, the customary rundown of upcoming weekend sports events. Boys’ basketball at Breck. Girls’ basketball at Hutchinson. Girls’ hockey—the Fire vs. the Wildcats at the Waconia City Ice Arena. The immediate reaction to the last announcement: applause and a few enthusiastic cheers. And so a new and very natural rivalry has formed. For 11 years (2007-2018), Waconia and Holy Family girls’ hockey players suited up in the same locker room, sharing jerseys that reflected the 50/50 split of a co-op team called the Wildfire—a combination of Waconia’s “Wildcats” nickname and Holy Family’s “Fire.” Now, each school has returned to its respective team names, shedding the complexities of juggling a program to fit both schools. Holy Family Activities Director Nick Tibesar says the former co-op team was naturally working against how the two schools were wired as fellow Wright County Conference members. He knew coming to Holy Family in 2016 that it was a matter of “when,” not “if,” the change would come to girls’ hockey. 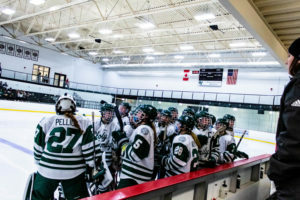 So in 2017, Holy Family and Waconia agreed to end their co-op girls’ hockey team, with the 2018-19 season marking the beginning of a new era with two independent teams. 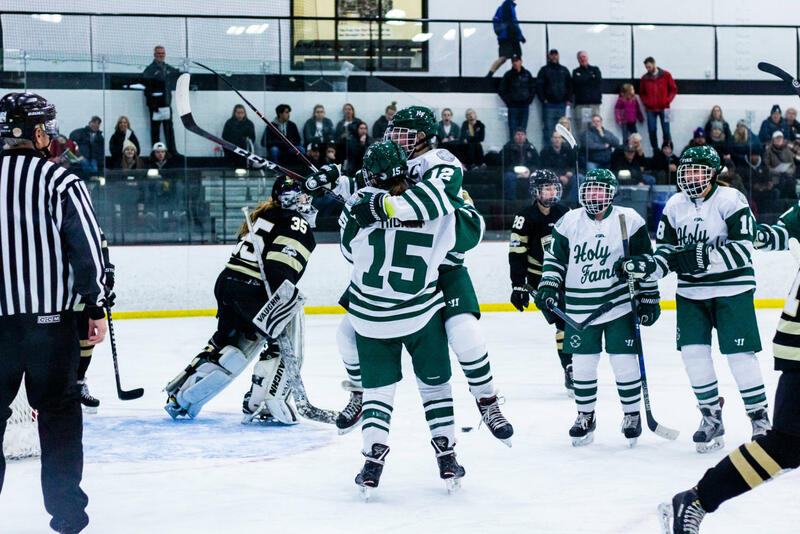 With the co-op over, Holy Family has implemented a plan to stand on its own in the competitive world of girls’ high school hockey. Even before the season began, coach Randy Koeppl decided every skater would play at least one period in a junior varsity game. That made it easier to schedule opponents looking to build their own programs through JV competition. Fifteen games into the Fire’s inaugural season, Koeppl is proud his plan is working, with all 23 skaters (excluding three goalies) having played JV this season. The plan worked. Sure, there were some hurdles to overcome. For instance, many Holy Family players live in Waconia, and for them it meant lining up on the opposite side of the ice from teammates they played with for years. “It was a big surprise to me because I played with those girls my whole life,” says junior captain Lauren Hickey, who transferred from Waconia High School to Holy Family her freshman year. “It’s hard, but I think it’s better for both of us because it makes us one team from one school,” adds sophomore Sadie Long, who’s also from Waconia. Junior captain Caitlin Rock heard rumblings that the co-op would end, but that still didn’t make it any easier to handle the news. 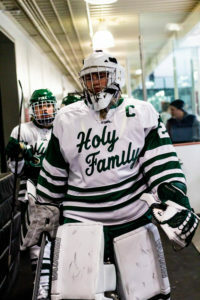 Eventually, the excitement of representing Holy Family as Fire girls’ hockey began to set in. After all, the Fire boys’ hockey program has become a legitimate force in Minnesota high school hockey. The belief is that Holy Family girls’ hockey could and should do the same. Plus, there is a certain satisfaction that comes with recording a number of program firsts, he says. It’s something no other Holy Family girls’ hockey team will have a chance to experience. And then there is the natural chemistry surrounding this team. Success doesn’t hinge solely on wins and losses. It goes deeper. Koeppl notices a difference too. After all, he coached the Wildfire co-op team last year during its final season. December 4 marked history with the drop of the puck at Victoria Ice Arena, the Fire’s home ice. It was the first conference girls’ hockey game between Holy Family and Waconia. Holy Family cruised to a decisive 8-0 victory. Many players on Waconia’s roster were under Koeppl’s guidance just a year ago. That wasn’t lost on the Waconia players. “Three or four of them came over and said, ‘Hey, how are you doing Coach?’ ” Koeppl says. For the Holy Family players, it was a game between friends as much as it was a time to be competitive. The anticipation to play against former teammates amplified the pregame nerves for Rock. Holy Family traveled to Waconia City Ice Arena on January 11 for their second meeting. 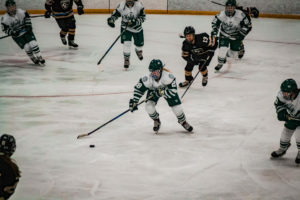 Rock scored her 50th Holy Family goal that night, as the team cruised to an 11-1 victory and a 2-0 game lead against the Wildcats. Those early games set the tone for what could be a budding rivalry. Koeppl may just get his wish. When the co-op ended, Holy Family had the option to move from Class AA to Class A because without Waconia’s student body, Holy Family’s enrollment dropped below the threshold that once forced it into Class AA. After consulting Tibesar, parents and players, Koeppl said everyone agreed Holy Family girls’ hockey should remain in Class AA. It also comes at the cost of short-term success, with Koeppl noting Holy Family would likely be a top-six team in the state in Class A. But Holy Family girls’ hockey is building for the long term. That optimism doesn’t just reflect Koeppl’s belief. He hears it from others well connected in the Minnesota hockey community. About the Writer: Mike Nelson graduated from Holy Family in 2008. He is an editor and writer at the Star Tribune in Minneapolis. Since graduating from Marquette University with a degree in journalism, he has also had work appear in Bleacher Report, the Milwaukee Journal Sentinel and MLB.com. Nelson lives in Burnsville with his wife, Kim.